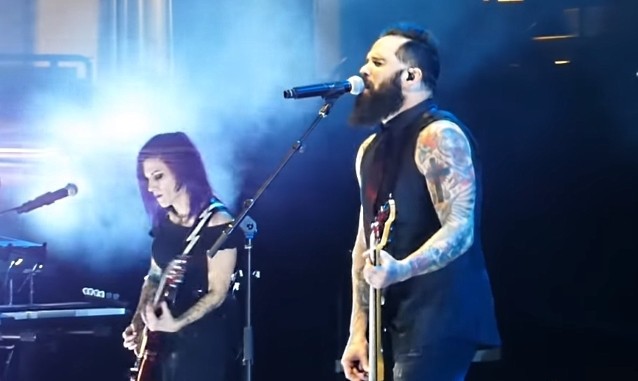 SKILLET performed two new songs, apparently titled "Rise Up" and "Dead Man Walking", during its March 15 concert at the Dow Event Center in Saginaw, Michigan as the support act for BREAKING BENJAMIN. Fan-filmed video footage can be seen below. SKILLET was joined at the Saginaw show by former FLYLEAF singer and current Christian rock solo artist Lacey Sturm, who was filling in for SKILLET drummer and female vocalist Jen Ledger. Lacey did not play drums at the gig, but was lending her vocals to the group in Jen's absence. Ledger was forced to miss several SKILLET concerts because they overlap with the "Winter Jam Tour Spectacular", on which Ledger is a featured artist this year. Last fall, SKILLET frontman John Cooper told Consequence Of Sound that the band's next album would arrive this summer. He stated about the record's musical direction: "I do think the new album is going to be a bit heavier, but we're going to have those arena anthems and also some duets with Jen [Ledger, drummer] and me, which our fans love. I'm excited for it." SKILLET's latest effort, "Unleashed", was recently certified gold after accumulating half a million certified units. The distinction follows on the success of lead single "Feel Invincible", which was gold-certified in 2018. "Unleashed" is the fourth consecutive SKILLET record to receive certification of either gold, platinum or double platinum.